CLIMB! is a very clever and original game. 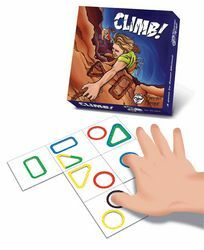 To reach the summit, players use holes on cards as holds of the route. Performing complex manoeuvres is the key: the more fingers a player puts on the table, the more points they score. But watch out because you don't want to fall. If any card moves, your turn stops. To make it even more interesting, each hold is bordered by a colour code you must follow. One finger can only be in one colour... (*a code helps colour-blind people). You can play CLIMB! alone too! Download the routes created by Benoit Michaud himself, the designer of the game, and place your route cards as indicated. You must reach the score in the hexagon in one try, following standard rules. Good luck!